Incredibly efficient city designs inspired by arcology could scale up mixed-use development and sustainable mobility while minimizing environmental impacts. Norman Foster rendering via Forgemind ArchiMedia/Flickr. By 2050, the world’s population is estimated to grow to 9.6 billion, with 66% living in cities. How can we accommodate urbanization while avoiding costly urban sprawl that can lead to unequal access to transport and increased greenhouse gas emissions? The efficient, dense, self-contained cities of arcology are one exciting possible solution. Arcology – a combination of the words architecture and ecology – is an architectural design principle that focuses on creating a hyper-dense city within a highly integrated and compact three-dimensional urban structure. It is the antithesis of wasteful consumption, facilitating access to shared infrastructure services, conserving water and reducing sewage; minimizing the use of energy, raw materials and land; reducing waste and environmental pollution; and allowing interaction with the surrounding natural environment. An arcology approach also emphasizes human connectedness and, through mixed-use development principles, makes walking the primary mode of transport. Italian architect Paolo Soleri (1919-2013) developed the concept of arcology. In 1947, he came to the United States and spent a year and a half in fellowship with Frank Lloyd Wright. For over 40 years, the proceeds from his award-winning ceramic and bronze wind bells have funded construction to test his theoretical work in arcology. In 1964, he and his family established the Cosanti Foundation, an educational organization. The Foundation’s major project is Arcosanti, a prototype town in central Arizona based on Soleri’s concept of arcology. Today, Arcosanti is an urban laboratory, attempting to test and demonstrate an alternative human habitat. Thousands of students have participated in the educational program and on-going construction of Arcosanti, which hosts 35,000 tourists each year in guest facilities. The Arcosanti project has gone through numerous design changes since inception. The current master plan, Arcosanti 5000, features layers of super structures designed to provide facilities to support a population of 5,000 people. 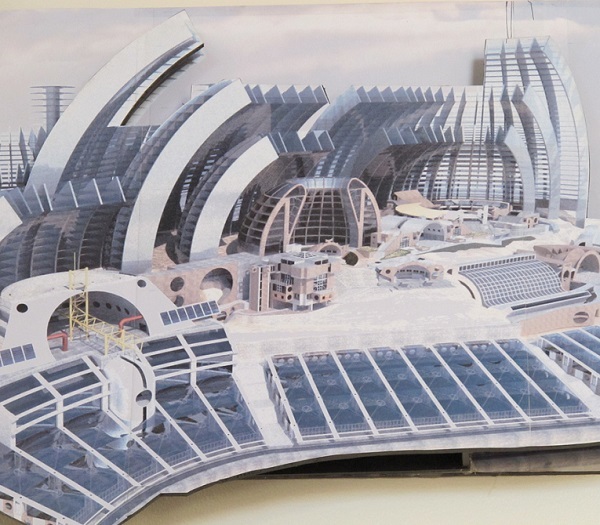 Arconsanti, the prototype of arcology creator Paolo Soleri, is being incrementally constructed to eventually support a population of 5,000. Photo by Doctress Neutopia/Flickr. Arcology remains an unproven concept, and as Arcosanti demonstrates, completing a dense, self-sustaining structure is an ambitious goal. Still, architects around the world are planning arcologies that could have a dramatic impact on urban design, and a few have even made it beyond the planning stages. Read on for some of today’s city designs inspired by the tenets of arcology. 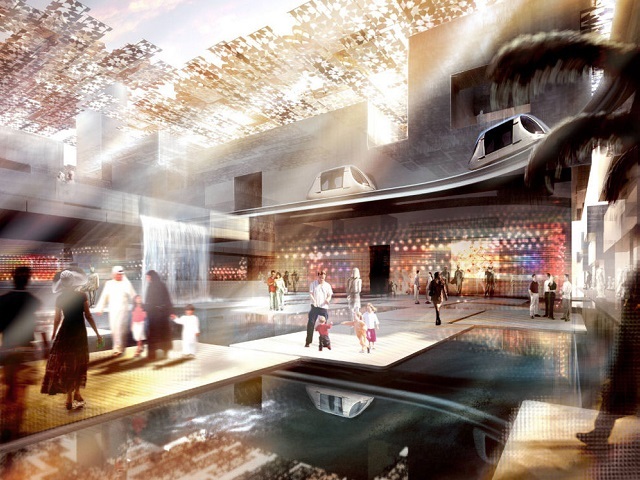 As one of the first cities inspired by arcology to begin construction, Masdar City could help serve as an example for sustainable, efficient, arcology-inspired cities around the world. Photo by Inhabitat Blog/Flickr. In 2008, Masdar City broke ground in Abu Dhabi, United Arab Emirates, endeavoring to develop the world’s most sustainable eco-city. Narrow, shaded streets help capture prevailing winds and keep the city cooler. The city also uses energy generated onsite from solar rooftops. The city prioritizes walking and cycling, but it also has an integrated transport system that includes light rail, automated pod cars, and a variety of electric-powered public transport options. 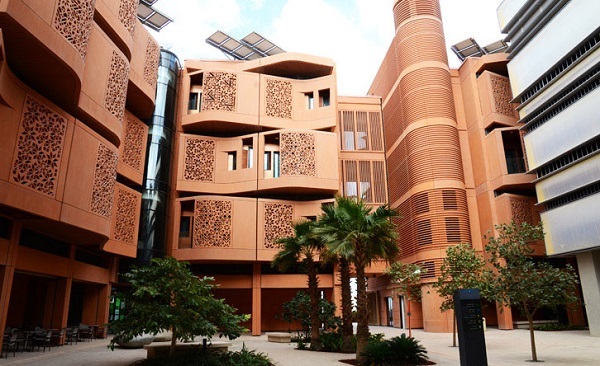 A few thousand people currently live and work in Masdar City. When complete, the city aims to house 40,000 people, with an additional 50,000 commuting every day to work and study. With pedestrian ramps that weave throughout the building, the Endless City in Height entirely reimagines the function and feel of a skyscraper. Image via Dailymail.co.uk. The Endless City in Height skyscraper design by SURE Architecture would function like a vertical ecosystem, with ramps wrapping the inside and outside and connecting different spaces within the skyscraper similarly to streets. 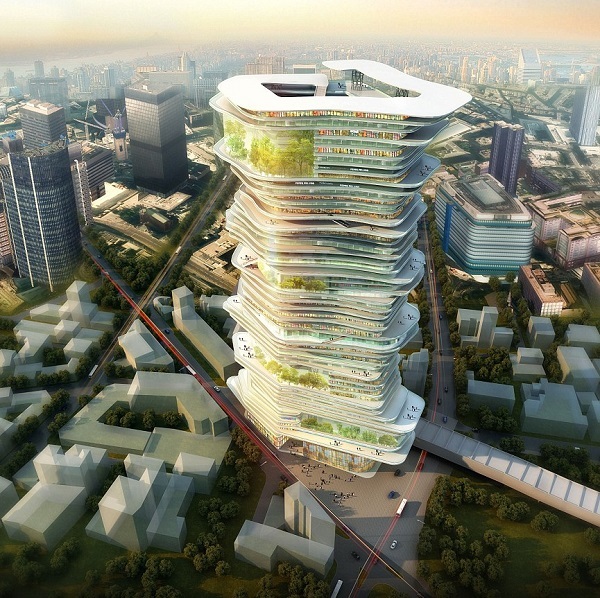 The mixed-use tower would feature various sustainable approaches to energy, water, and waste management. For example, it aims to maximize passive energy and reduce artificial lighting, ventilation and cooling needs. The Endless City in Height was designed for London, and won the 2014 SkyScrapers and SuperSkyScrapers Competition. The BoA, short for Boston Arcology, was designed as a floating city for 15,000 people containing hotels, offices, retail, museums, condominiums, and a new city hall. BoA would supplement walking with moving walkways and/or electric train carriers. It would also aim to achieve carbon neutrality through features such as wind turbines, fresh water recovery and storage systems, gray water treatment, and solar panels. Harvest City was designed to be a floating agricultural and industrial city for Haiti after the devastating 2010 earthquake. The two mile diameter complex of tethered floating modules would accommodate 30,000 residents. Features include one-acre crop circles and energy generation from solar panels and wind turbines. Floating aquifers would also collect and protect water while waste would be managed with composting toilets and compact treatment plants. These are only some of the existing arcology designs. To accommodate new residents, cities of the future must be well-planned, resource efficient, and connected places to live. It remains to be seen whether arcology designs can become a consistent part of that urban future, and whether they can be part of equitable communities instead of being utopias for the wealthy. Still, whether Arcosanti in the desert or the Endless City in London, arcologies could scale-up the benefits of mixed-use development and sustainable mobility.